Spilsby Town came from behind to beat Wyberton Reserves 4-2 in the Workforce Unlimited Premier Division. Two goals from Josh Foreman put Wyberton ahead before the champions claimed a further three points. Kirton Town thought they had won the game with eight minutes to go as they led Pointon 3-1, but Pointon came back to claim a 4-3 success. Benington and Coningsby shared a seven-goal thriller, but it was Coningsby who came out on top winning 4-3. Josh Brason hit two and Sam Reed also netted for Benington. Swineshead Institute find themselves second-bottom after losing 2-1 to Skegness Town Reserves. Luke Smith scored the only goal for Railway Athletic against Old Leake in a 1-0 scoreline. 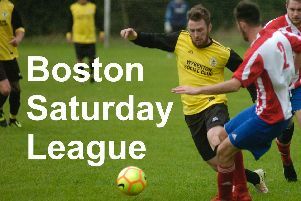 In the big game in Division One, Fishtoft beat rivals Boston College 1-0 thanks to a Tim Bell goal. Friskney moved into third place with a first-half penalty from Victor Sibert, giving them a 1-0 victory against Park United. FC Hammers beat Pointon Reserves 4-1 and, in the other game, Billinghay Athletic beat Freiston 3-2, John Rutherford scoring both goals for Freiston. In Division Two, Eagle United beat Coningsby 4-1. Tom Bates, Danny Woods, Elliot Pogson and Oliver Warrington were on target for the Eagle. Caythorpe and Boston Athletic shared 11 goals, Athletic winning 6-5. Holbeach Bank finished off the season as they started, losing 3-2 to JFC Boston. Lee Cameron scored both goals for Holbeach and, for JFC, there was one apiece for Brandon Norman, Lewis Gosling and Reece Sullivan. Woodhall Spa Reserves booked their place in the final of the BB Insure Willoughby Shield by beating Skegness Town A 2-1 after extra time. Adam Brooks and Ollie Cranfield were on target for Woodhall and Josh Whittam scored for Skegness.